Perhaps you’ve not been privy to the battle that’s been going on for the last several years. On one side, you have the traditional media, the “mainstream.” On the other, you have alternative media, the “outliers.” The icons of both sides are locking horns at the moment, and you’re about to witness an epic slaying. Note the quick metaphor: David (James O’Keefe) is winding up his stone (undercover videography) to bring down Goliath (The Washington Post). It may be overly optimistic, but I don’t think there is a lot of optimism mixed in with my prediction. The story is playing out extremely predictably. Here’s what went down yesterday. Project Veritas (the nonprofit citizen journalist organization headed by James O’Keefe) was caught trying to lead The Washington Post toward an alleged bias. The undercover journalist pitched a story that she was raped by Roy Moore. The Washington Post caught the exchange on camera, essentially exposing the Veritas sting operation. It was portrayed as a “gotchya” moment in the battle between the two. Well, some have seen it this way. They exploded social media with claims that James O’Keefe has finally been busted for his low-grade, sneaky videos. Media-ite is making fun of him. The “giant” Washington Post is pulling out all their guns, a full frontal force to crush the rinky-dink operation of Project Veritas. They see this as the end of James O’Keefe. I see differently. There is a stone lodged squarely between the eyes of the giant, and you’re about to see it crash to the ground. Then you’re going to witness a beheading. Consider three significant realities unfolding before your eyes. Compared to WaPo, not many people know of O’Keefe’s life work. I wish they did, because I believe he is reclaiming journalism for what it should be: A watchdog and irritant of the elite and powerful. He doesn’t get much recognition in the media because, well, the media (for now) is part of the elite and powerful. Exposing voter fraud in several states, forcing reform of election laws. Exposed ACORN of child-slavery racketeering, bringing the downfall of the powerful group. Exposed Planned Parenthood of similar evil, leading to the firing of one of its vice presidents. Exposés that lead to more embarrassments: Hillary Clinton, NPR, etc. It’s sometimes hard to keep up with O’Keefe’s stories. He doesn’t have the mighty resources of the mainstream media, but he has hidden cameras and a staff of videographers working their way into the media elite and powerful. Here’s the reality: The Washington Post seems to have caught on, but much too late. They attempted to reverse the sting on one Project Veritas’ undercover agents. On the surface, it appears incriminating (somewhat), or at least that’s what the elite and powerful media wants us to believe. Apparently Project Veritas delivered a false story of a woman who got pregnant by Roy Moore. The Washington Post didn’t fall for it. And this is their apparent “gotchya” moment. This is likely the best they’ve got. When you analyze how The Washington Post announced this, you’ll see why they’re about to fall. Big time. Take a good hard look at this title. If you read it from their perspective (the elite and powerful who are annoyed at this little boy coming at them with stones), this makes perfect sense. “A woman” approached them with a “false tale about Roy Moore.” A-ha! The Post has been reporting about Roy Moore accusations. “She appears to be part of undercover sting operation.” A-ha! See? Just like a giant, The Washington Post is so entrenched in their own power that they fail to recognize how anyone else — like, everyone outside their elite — will read this headline. Consider those who do not trust The Washington Post, or anyone who is doubtful of the original Post story about Roy Moore, or an Alabaman voter. They lean toward discrediting the original Roy Moore story, that the original tales are false, and it is a behind-the-scenes operation attempting to bring down Roy Moore. Same headline; very different perspectives. The title they chose confirms everything you already suspected: The Roy Moore story is false, always has been. And the fact that this comes from The Washington Post puts this to rest. This is such persuasive clumsiness that it causes me to think one of two things. James O’Keefe has such incriminating video up his sleeve that WaPo clumsily ran their story to press, tripping over themselves to minimize the impact. Or there is a spy within WaPo’s copyrighting department that is actually working for James O’Keefe. This headline is that bad. Am I reading into this? I don’t think so. Because O’Keefe’s next step is as predictable as David’s next step. It isn’t going to be pretty. At the time of writing this, all of social media is hounding James O’Keefe. Everything seems to indicate the downfall of Project Veritas. The hooting and howling is extremely loud on my Twitter feed. Just like the Palestinian army of old. They were expecting to see a boy get torn apart. But their giant fell. And then the boy pulled out the giant’s own sword and cut its head off with it. James O’Keefe will come out with a video showing how corrupt the inner dealings of the Washington Post really is. A top manager or executive or hotshot editor will be shooting their mouth off over a beer somewhere, in front of a Project Veritas camera. Whatever he or she says will be blasted all over social media as concrete, visual proof, discrediting The Washington Post and anything they say afterward. They will try to minimize the impact, but then O’Keefe will come out with another video. More attempt to shrug it off. And then another. I predict three videos. Followed by mass delusion from the mainstream media, further discrediting themselves. Articles will be written about how fraudulent the videos were, how they were severely edited, how James O’Keefe was arrested years ago, yada yada yada. Lawyers will make some money because O’Keefe will sue attempts to discredit him, as they’ve done so much in the past. Retractions will reluctantly be made by WaPo and their friends (NYT, CNN, and others). If you gauge my prediction with the current social media out there, you will think that my prediction is totally off the charts of believability. But I think it is incredibly predictable. Project Veritas has been doing this for years, leading to new laws, criminal investigations, firings and resignations of the most powerful and corrupt, even arrests. You know, things the media should be doing. Last night The Washington Post handed their megaphone over to James O’Keefe. Millions are now watching him see what he’s got. He’s posted some teasers already. We’ll see. I think we’re going to watch the beheading of The Washington Post. Update 11/28: James O’Keefe announced on Titter that there will be four videos forthcoming of undercover journalism of the Washington Post. This is quite possibly the dumbest thing I’ve ever read. Let’s review: O’Keefe, a convicted felon who couldn’t get a real job if he tried, operates Project Veritas in a manner that he fantasizes professional journalists behave: With an agenda and in bad faith. Time and time again, he’s tried — and failed — to “get” a professional news organization, where reporters and editors tend to be smarter than he is and employ basic tactics such as “due diligence” as part of their reporting. (This is called operating in “good faith” mind you). And when he, HIMSELF, is exposed as a clumsy, rank amateur, he thinks a video of someone explaining the difference between the news side and the editorial side of a newspaper is some kind of “gotcha” when that’s actually a basic tenet of journalism taught in high school journalism classes. Which O’Keefe clearly never took. And you think he’s got to goods. Hilarity. The stupid: It hurts. O’Keefe was not convicted of a felony in the Landrieu case. He pled guilty to a misdemeanor for unlawful entry of her offices, the plea being accompanied with a statement that he did not intend to commit a crime, but entered the offices in pursuit of a story. So how is he a “convicted felon”? Was there something else? 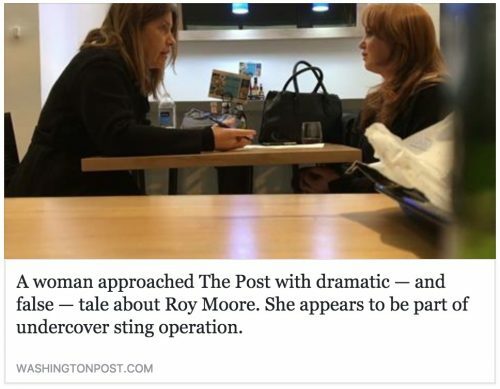 So the pawn in this case–roy moore fakenews lady–accomplishes 3 things: 1) it actually detracts from the roy moore accusations, 2) free advertising for PV–it inserts the name Project Veritas into the mainstream media, which then begs the followup on the story, which they now have to cover or else it will look bad for them if they don’t, when the Project Veritas undercover files hit youtube and go viral, 3) it discredits the discreditor, so even though the sting failed and PV was caught using a propagandist, it actually says that–given PV’s track record–that whatever they produced was NOT using that woman undercover but others. Discrediting the discreditor means basically that PV hired the Moore faker for the SOLE PURPOSE of entrapping WashingtonPost into giving PV free advertising. It’s pretty brilliant spycraft actually, what PV is doing.